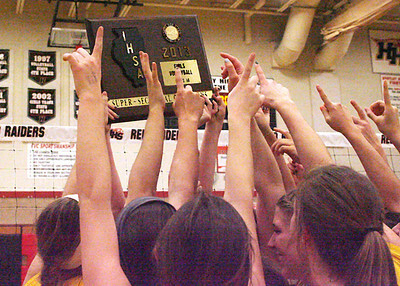 Don Lansu for the Northwest Herald The 4a supersectional girls volleyball trophy is hoisted towards the rafters as the Crystal Lake South gators celebrate their win over Lake Zurich H.S. 25/18,and 25/18 in Huntley 11/9/13. Don Lansu for the Northwest Herald: Carly Nolan (16) of Crystal Lake South's girls volleyball team goes for the spike against Lake Zurich H.S. as her teamates position for the return. 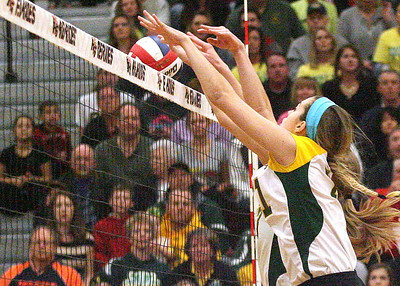 Crystal Lake won both games 25-18 to secure the 4a supersectional victory 11/9/13. 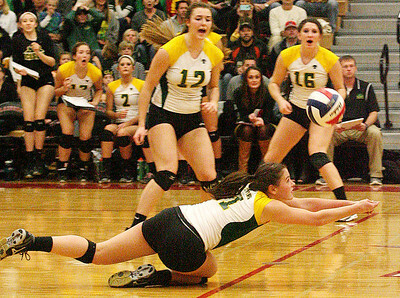 Don Lansu for the Northwest Herald:Crystal Lake South's Tori Falbo (11) makes a diving save during action iin the 4a supersectional , as Nicole Slimko (12) and Carly Nolan(16) look on. Crystal Lake So. defeated Lake Zurich 25-18 in both games to seal the victory. 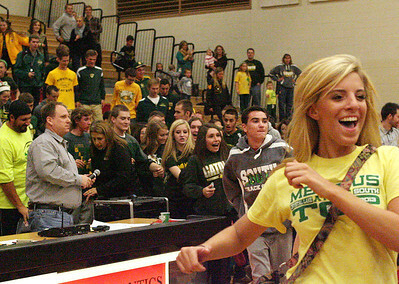 Don Lansu for the Northwest Herald: Crystal Lake South girls volleyball fans stream onto the court to help celebrate their win over Lake Zurich H.S. at the supersectional 4a match held at Huntley H.S. 11/9/2013. Don Lansu for the Northwest Herald:Crystal Lake So. 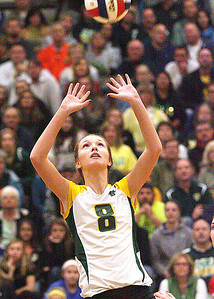 Jr. Cassey Sivesand sets for the point during super sectional Class 4 A at Huntley H.S. 11/9/2013. Crystal Lake So. won both matches against Lake Zurich. Don Lansu for the Northwest Herald:Crystal Lake So. Sr. Katy Hoenle makes the defensive play at the net, during action against Lake Zurich. The match took place at Huntley H.S. and was a super sectional 4a game. 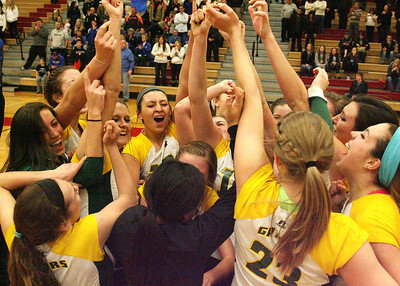 Don Lansu for the Northwest Herald:Crystal Lake South varsity girls volleyball team celebrates their 4a Supersectional victory over Lake Zurich H.S. CLS won both matches 25-18 for the trophy. The match was held at Huntley H.S. 11/9/13. H.S. at the supersectional 4a match held at Huntley H.S. 11/9/2013.